Try this delicious snack perfect for holiday entertaining! It's easy to make and everyone will love it. Microwave Method: Melt morsels in large, uncovered microwave-safe bowl on HIGH (100%) power for 1 minute; STIR. Morsels may retain some of their original shape. If necessary, heat at additional 10 to 15-second intervals, stirring just until morsels are melted. Stir in peanut butter and peanuts. Add cereal and mix gently until well coated. Place powdered sugar in large, resealable plastic storage bag. Add coated cereal; seal. Gently toss cereal until well coated. Store in airtight container in refrigerator. 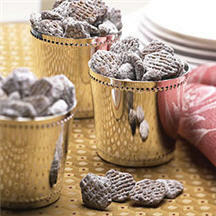 Stovetop Recipe: In small, heavy saucepan melt chocolate morsels over low heat, stirring constantly. Stir in peanut butter and peanuts. In large bowl pour chocolate mixture over cereal. Stir until evenly coated. Place powdered sugar in 2-gallon, zipper-type, plastic bag. Add cereal mixture. Close bag and gently toss until evenly coated. Store in airtight container in refrigerator. Recipe and photograph courtesy of the KELLOGG® Company. ®, ™, © 2004 Kellogg NA Co.